If you are a regular reader of my Lens and Pens, you know that I’ve been incommunicado for over two weeks. Those days were charged with adventure, happenstance, reunions, serendipity, and tenderness. Emotions were on high alert, and mine succeeded in spilling into my heart and soul with vengeance and a treasure trove of bizarre and wondrous moments. While I’ve been in Northern California on other occasions, this journey was stacked with firsts and day-after-day of hypersensitivity to this region’s expansive wilderness and kaleidoscopic cities: the primitive and pristine mixed with the historic and modern, and my almost prancing between rural and urban. More importantly, I spent every day with family and friends, so the memories become layered in so many directions that they are relived with the most genuine of affection and gratefulness. Each day’s experiences have settled into a deep inner well that keeps nourishing me with intense flashbacks. How fortunate I am, and I know it. While I’ve had similar experiences in California, the elements that converged made it an exceptional passage through place and time. I’ve returned rejuvenated, and accompanied by an even deeper sense of reverence and wonder. This holiday was another pilgrimage that wavered between the present and the past. Truly, every new venture is partially influenced by what has been, and yet the new enters as a fortress with room for the familiar and unfamiliar to influence todays and tomorrows. Narratives were woven around three cities: Nevada City (in the Sierra Mountains), Berkeley and San Francisco as well as side trips (e.g., Oakland–the New Brooklyn) to other remarkable places. While each has its own appeal, the spiritual effects of this trio was a never-ending combination that coalesced into rich, sweet, tender and vibrant passages. While the destinations alone would be a triumphant package, it was the mixture of adventures shared with each person that was the entry point for remarkable confluences of events and occurrences. Mostly, I can boast of spiritual discoveries along with new vistas in the wilderness and urban landscape. Often when I view such splendor I am prone to welling of intensity: tears rising and blurring my view, which stills me and that is a good omen. Still that emotion is a testament to the visual abundance that rocks my inner and outer worlds. Simply, Mother Nature inspires me. While springtime on the West Coast can be vacillate in temperatures, on this excursion Northern California weather cooperated: sunny and warm days with cool nights: perfection. We even had one overnight and morning rainstorm, which is very much-needed throughout the region. This initial post is one of several to be launched about my trip. Most of the days were spent in the region north and south of Nevada City that is filled with the Gold Rush’s legacy to American history. But visits to Lake Tahoe and Yosemite National Park were more than memorable. They’re locked into my past and present. The remainder of the trip was spent in Berkeley and San Francisco: two cities high on my list of “I could live” in their yin/yang urban and close-by natural environments. They have so much (including family and friends) that it astounds my sensibilities. I will need many posts to show the depth and breath of the landscape–scenes that stole my emotions. But also while my iPhone 4s did record splendor, my Nikon DSLR was necessary to get the crystalline views of such monumental images. In the Lens section is a sampling of the trip’s tribute to Mother Nature. There are seven images that begin to detail the variety of my trip’s main theme: mostly the wild. Part I: Colfax, south of Nevada City-Cedars are captivating for their dimensions, but it’s their texture that also lures me. On a visit to friends where they live on a ridge in Colfax, this cedar’s majestic stance is about to be leveled due to the bark beetle. 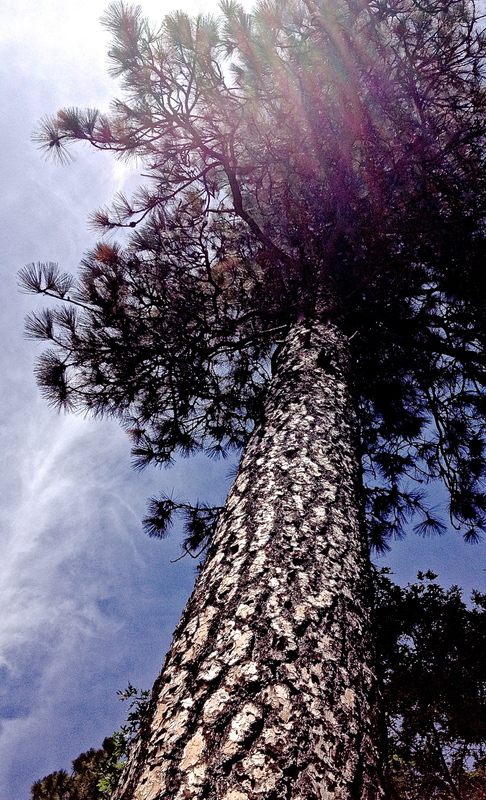 Sadly, its existence is being joined by others affected, including pines, by the same plight in Northern California. Part II: Crystal Hermitage Gardens, Nevada City-These spring gardens are spectacular, and are only open to the public in April. I felt fortunate to be able to stroll through their 13,500 tulips that are luscious to the eye. They are cultivated and maintained by the cooperative spiritual community, Ananda Village, which is in the foothills of the Sierra Mountains. The tea gardens and views of the Yuba River Gorge are powerful visual scenes. 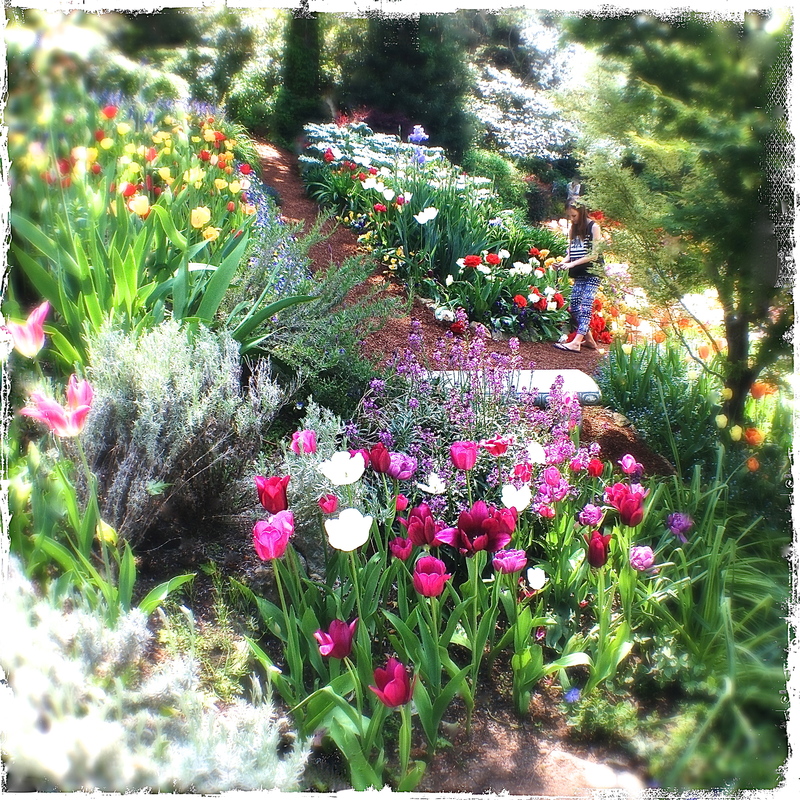 We strolled through the tulips that were nestled in terraces, and each row invited you to gaze at individual and clusters of colors and varieties. We heard about the mouth-watering scones, but kept focused on the flowers and the serenity and solitude. Part IV: Marin Headlands-At the Marin Headlands is the Point Bonita Lighthouse. After a half-mile walking trail brought us to the tip of the headlands, the expanse initiated an inner gasp. 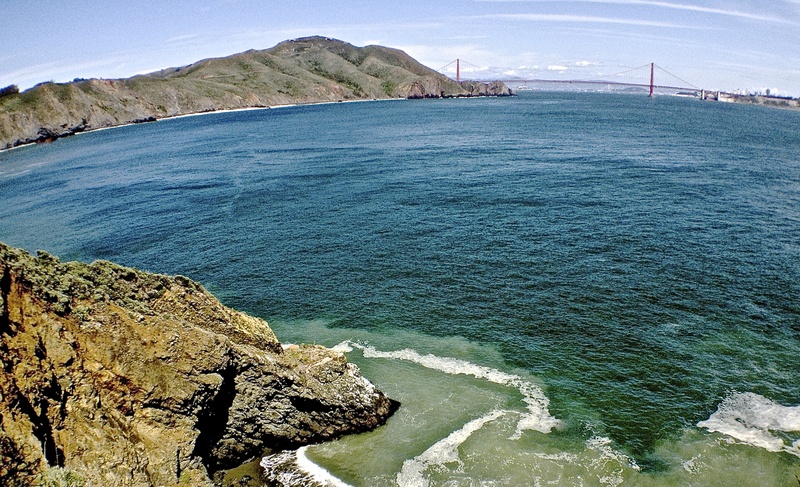 Point Bonita is part of the largest urban national park in the United States. The Lighthouse serves as a guide to waters that take maritime travelers through the Golden Gate (connects San Francisco Bay to the Pacific Ocean) and under the Golden Gate Bridge. The view takes your breath away and holds it in safe keeping. This excursion was capped by a sighting of 130 harbor seals. I hope that you get a slice of the joy that I experienced. I’m happy to answer any questions, because if you want a place to dig into Mother Nature’s omnipresence and so much more, then Northern California offers a sweeping variety: architecture, arts, cuisine, culture, entertainment, history, and natural wonders. Each comprises the tame and the wild. Tip of the Week: For those of you who are new to using your Smartphone as your camera, you might want to read a short article from The New York Times Getaway column from 27 April 2014. James Hill wrote “Snapping Good Photos with Your Phone.” While on the Amalfi coast in Italy, he found himself without his SLR, and turned to his iPhone to record his vacation. He discusses a few apps, and talks about close-ups, composition, framing, color coding, and dawn and dust. Click here to view it. Note: As always I welcome any comment about this post or any part of my blog. If you’d like to join the fun, please click here for details. 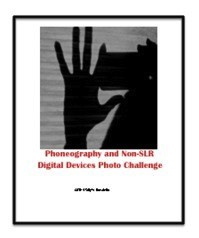 If you have any questions about the Photo Challenge, please contact me. 5th Monday: Editing and Processing with Various Apps Using Themes from the Fourth Week. This entry was posted in Abstraction, Black-and-White Photography, Gardens and Gardening, Human Nature, Nature Photography, Photography, Street Photography, Traveling and Travels, Writing and tagged California, Nature Photography, Northern California, Photography, Travel, Yosemite National Park. Bookmark the permalink. 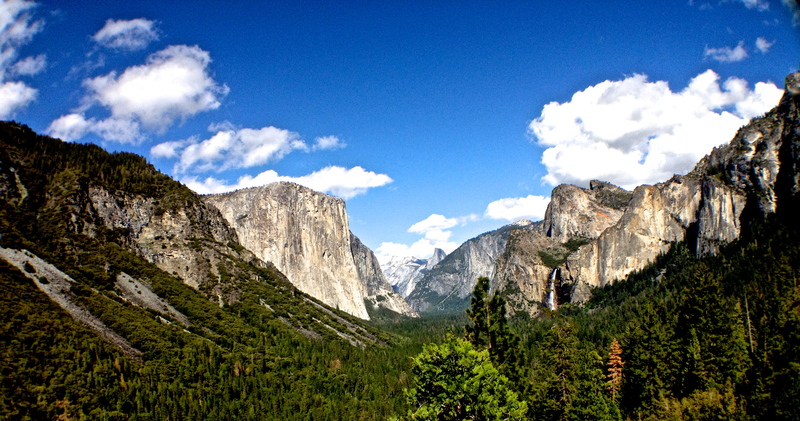 Love all pics you took at Yosemite National Park! It took me a moment to work out 6. I thought the sky was ocean. I love that disorientation – like waking up at night and having to piece together where you are. Lovely to hear from you. I appreciate your comment. Lovely to hear from you. Thanks so much. Love the waterfall!! Did you camp or stay at hotel? We stayed at a lodge that I’ll talk about in a post specifically about Yosemite National Park. See you soon. Thanks. I am really enjoying your photos from your trip. The tulip gardens are stunning. I think it is the vibrant colour that attracts my eye. I posted my nature contribution early. I must have missed the pingback. Delighted to have your comment and visit. Will move over to your blog now. Thanks so much. Lovely!!! I was wondering where you’ve been! Fabulous photos and can’t wait to see more from your trip! Nicole, it was a glorious journey. See you soon. Thanks. Your images are of great quality, I keep hearing the iPhone 4S camera came out to be the best. What a crisp, sharp images you got from sunny CA! Maria, Northern California is inspiration at each turn. I appreciate your comment and visit. Thanks. Welcome back. I’m pleased it was a restorative and lovely holiday. I’ll jump back into the posts next week. Be well – terrific submissions this week – very much a pleasure to view. Dawn, I appreciate your thoughtful comment. See you soon. Sally, I was touched by your expression of warm memories from your recent trip. I loved how you used the word layers to describe your many emotions, all beautifully said, and your photographs are fantastic! Elisa, I’m humbled by your comment. See you soon. Thanks so much. Nature does produce magical elements to woo us. See you soon. Thanks so much. Thanks so much for the beautiful pics! I’m glad you had a great time here in Northern California. Can’t wait to see the other pics. And thanks for the iphone article reference. I take my photos with my phone for my blog and, I think, they come out pretty well. I’m always looking for tips! Kathleen, please think about joining our photo community. The next challenge is Monday and focuses on Macro. I appreciate your comment and visit. I always wanted to see Yosemite. My friend went there last Summer and he said it was just beyond words beautiful. California is truly blessed with Nature. One of the main reason why someday, I wish to go back there and make up for what I missed. Have a great week! Oh, I do hope that you can fulfill that wish. It’s magical and wondrous in so many ways. Thanks so much. All photographs are beautiful. Nature is beautiful in every form. These are all beautiful! I especially love the effects you used for #3. The vibrant colors and the subject matter of all of them are breathtaking. Mary, thanks so much. Nature inspires. Suzanne, I appreciate your thoughtful comment. See you soon. Lovely Sally, it’s magnificent out there, isn’t it? We did a a similar trip 2 years ago and it was such a joy! I’m all for El Capitan – it’s so special! 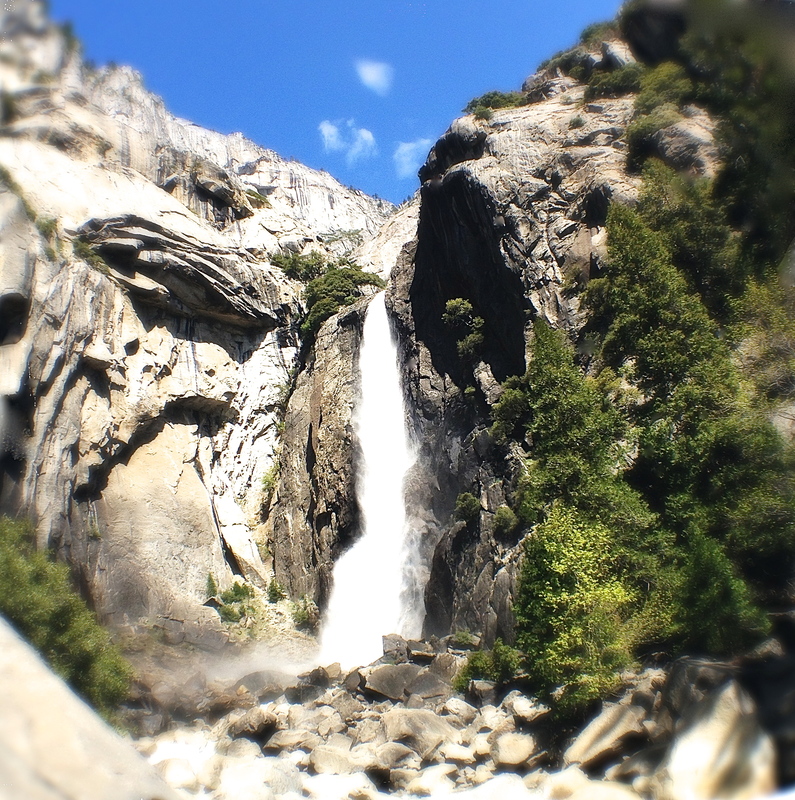 Tina, I was entranced with the waterfalls that were in their prime, even with the smaller snows this year. Fabulous that you had “similar” experiences. Yosemite is truly a national treasure. Thanks so much. Welcome home! Loved your new photos, especially the Yosemite pics. Mari, you are very welcome. Thanks. I’m so glad you had such a spectacular time in our wonderful state. Your heart, mind and soul seem filled with wonder and delight. What more can you ask for in a vacation? I adore Yosemite and your shots there are great, but my favorite of the bunch is the Marin Headlands. The view of the bridge is terrific! Meghan, you are very fortunate. I appreciate your comment. Thanks so much. Linda, that’s lovely. Thanks so much. Terrific, my iPad is the first generation sans camera. It’s fun and informative to see what they can do. Resolution is good on them. See you soon. Thanks so much. Sally, its wonderful to see you back, it sounds like you’ve had an amazing trip, and you have some beautiful photos (and memories) in your post! Ive mixed up my photos today, so I cant really enter as some were taken with my Sony camera. Trust me! Amanda, hope to see your participation next week. Steve joined this week, which was so nice to see his work. See you soon. Thanks. Oh, I missed you too, and it’s lovely that you expressed it. Thanks so much. Actually I would say no. It’s suppose to be a challenge that defies the use of the traditional camera. The point-and-shoot would fit into the traditional camera category, which are considered DSLR. I have in mind the lens that is more 21st century alternatives. But, in fact, I found the camera that you own described as: Professional DSLR-style handling and manual controls in a compact body; Wi-Fi and …Hope that helps. I cant see that description of it anywhere on the link Sally. It is definitely non SLR though. In that case I actually think the name of the challenge is misleading. Obviously its your call, but I can see confusion ahead. Another point to consider is this. When I chose this camera, I was choosing between 2 models, the one mentioned, and the QX10 which is a lens that attaches to the iPhone. The camera shop explained that it was the same camera within a different body. If I had gone for the QX10 I would have used those shots in the challenge without hesitation. Im curious, what is your opinion on those types? I’ll get back to you. Am giving it some further consideration. It is good to see you back safe and well. Here is my post. Love your photos. So, here you were in my stomping grounds! I’m so glad you had a good time and saw wonderful things. As Allan says, we have a treasure trove here in this area, and I am so blessed to live here. I can’t wait to see all of your photos! Your collection today is wonderful, each and every one is my favorite. Have a great week. Angeline, I must tell you that I wanted time to bring together those of you in San Francisco that I’ve met through my blog. Beside Allan and you there are others. It was not possible this trip with family and friends tugging at me. I am totally in like and love with San Francisco and the entire Northern part of California. I wanted to leave a comment on your post, but the comment section was not there. See you soon. I’ve turned off comments for just awhile. I’m heading into some busy days and didn’t want to offend anyone with no responses to comments left. I have a post that I’m putting together for Wednesday or Thursday with details. Angeline, it would be a memorable experience to have a reunion of those of us that have been sharing, and have never met: aka the life of a blogger. See you soon. 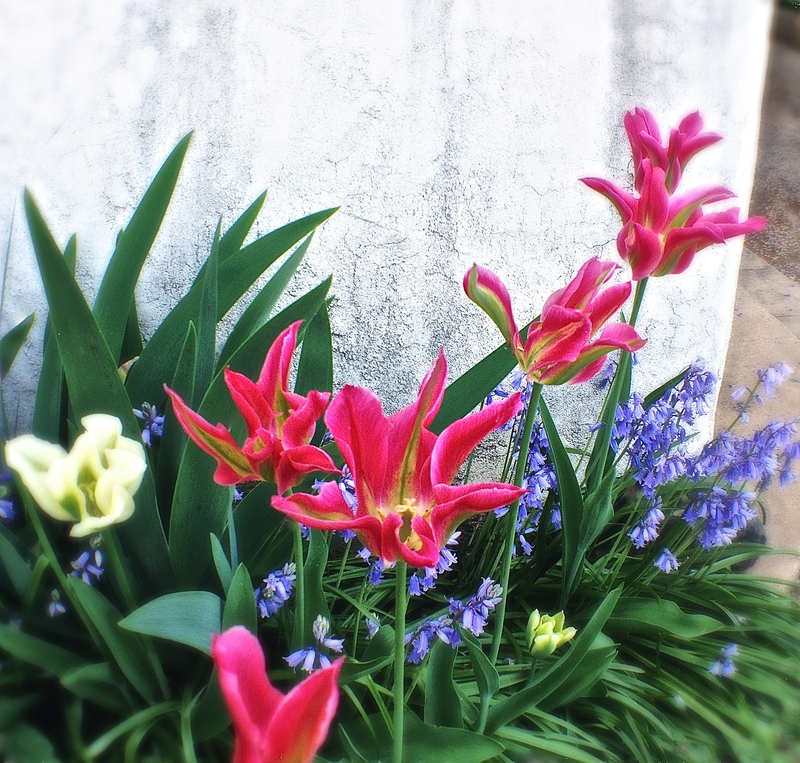 I love the splash of colour in the Tulips photo. 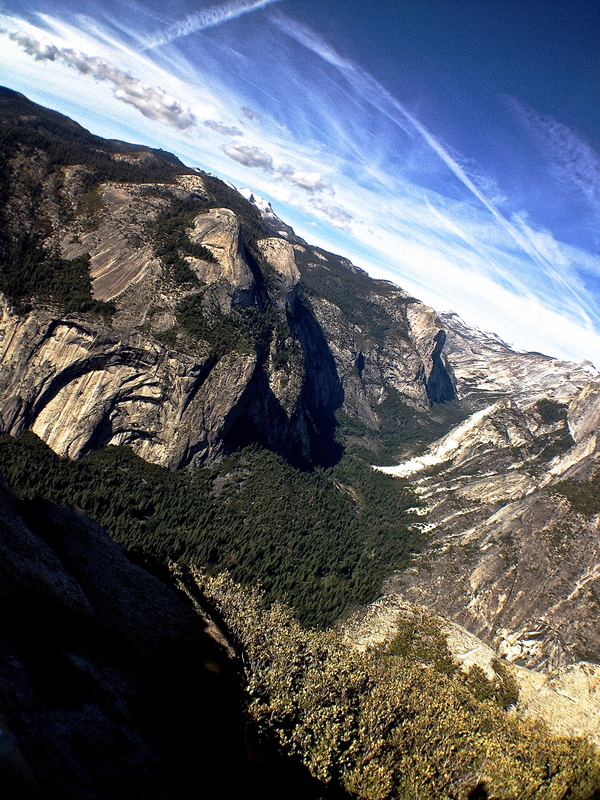 Also, the angle of the View from Glacier Point almost gives me vertigo, but it’s great! Steve, welcome back–so nice to have you participating. Glacier Point is a tour de force of nature. It’s truly amazing. See you soon. Thanks so much. It’s nice to hear from you. Thanks so much. Thank you for visiting. See you soon. Now this isn’t fair Sally. I can’t pick one today. I think you did a terrific job on all of them. I love California and all its beauty. Edith, what always surprises me is the power of my iPhone 4s. They’ll many more with the iPhone and my Nikon DSLR. Thanks for your thoughtful comment. Lovely to hear from you, I’ll await your photo. Thanks so much. Oh, it’s a challenge, but we’ll catch up. See you soon. Thanks. Welcome back. Reading your experience on your trip, it seems that you really had a great time on vacation. All of your photos look wonderful. No. 6th is my most favourite because of its sky and clouds. I appreciate your comment. See you soon. Thanks. Sounds like you had a great trip. Welcome back. Beautiful captures, Sally! Looks like a fun trip. I always come back with soaring spirit after a visit to family and friends, so I can definitely relate. Gracie, yes, it does invigorate, especially Northern California coupled with family and friends. See you soon. Thanks. Welcome back, Sally! I’m so happy you had a wonderful time on your trip and I look forward to seeing your photos and reading about your experiences. All your beautiful photos make me happy and long to see these places again (or for the first time.) But I’m especially drawn to the first two. I like the sense of height in the first as well as the ray of light and the second allows me to focus on the beauty of that small grouping of flowers. Have a marvelous week and enjoy all those memories! Janet, I do hope that you get to visit some or all of these wondrous places. Thanks so much. Welcome “home”. It’s lovely to see and read about your time away. My favourite of these photos is the last one of Marin Headland. It seems to embrace the viewer. Wonderful to hear from you, and thanks for the comment. The Marin Headlands is a special place that definitely wooed me. See you soon. I am looking forward to your NorCal posts. These photos are a wonderful tease. Allan, I have so many stories–some bizarrely serendipitous and other simply glorious. Your part of this country is a treasurer trove of adventures, and you are fortunate to live there. Hope all is going well at home. Thanks, Sally, things are improving for us. This area is a treasure trove and we know how fortunate we are to live here. The scenery/weather is beautiful and we have a wonderful group of family, neighbors and friends. What more can we ask for? All of that and retirement too: Life is good for you. That’s great. See you soon.